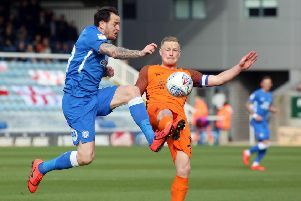 Marcus Maddison in action for Posh against Southend. Photo: Joe Dent/theposh.com. 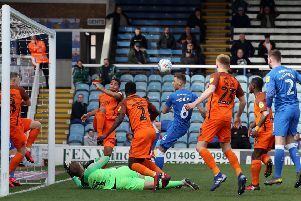 Peterborough United manager Darren Ferguson praised a great ‘team effort’ as Southend United were beaten 2-0 at the ABAX Stadium today (March 23). And he was right, although mercurial winger Marcus Maddison is bound to grab the headlines after scoring a high-class goal before setting up the other goal. Lee Tomlin of Posh battles for possession with Southend's Timothee Dieng. Photo: Joe Dent/theposh.com. Centre-back Ryan Tafazolli, skipper Alex Woodyard and attacking talent Lee Tomlin made strong returns to the starting line-up. Ben White celebrates a goal for Posh against Southend. Photo: Joe Dent/theposh.com. Matt Godden: (for Tomlin, 73 mins). Siriki Dembele: (for Ward, 73 mins). Kyle Dempsey: (for Maddison, 85 mins).